Lock in a great price for Nikki Beach Resort & Spa – rated 8.3 by recent guests! the property is heaven, The decoration of the room, the atmosphere, the quick service. Very good resort. Nice swimming pools and there are many activities in the resort everyday. We stayed 2 nights in Nikki, there was jazz performance at one night and live singing the other night. And the DJ by the pool side all afternoon, with hip-hop dancers performance occasionally. Residences here are nice and quiet, this is a very good place for relaxing. Great place to relax and chill. The beach club and swimming pools were good. The beach in front is quiet and clean. Staff were welcoming and friendly. The staff were lovely and accommodating. I felt special celebrating my 30th birthday here with a decorated bed of flowers and cake. Nothing was too much trouble for the concierge including a request for a Thai spa bath in my ocean view suite. I loved my room, it was modern, spacious and felt very upmarket. The view and sunset from both the room and the pool area was an absolute picture. The staff around the pool area on event days were friendly and again, nothing was too much trouble. If you’re as adventurous as I am, hire a scooter 2 mins down the road from the resort for a bargain price and explore the area! OMG! 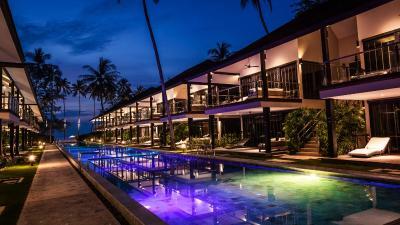 This is the best place in Koh Samui! Garden villa feels very private, is spacious and very well equipped. The common area around villas is fantastic and well maintained with beautiful plants, palms and trees. We got treated with fresh fruits in the afternoon and homemade cookies in the evening. Bed is super comfy, bathroom clean and spacious. Breakfast was amazing despite mixed reviews. Variety of food was fantastic, freshly made pancakes, egg station, vegetables and fruits, homemade banana bread was delicious. All that in a beautiful setting. We have enjoyed a complimentary yoga class with Rain (our yoga teacher) in the morning, best yoga we had in Thailand! Small gym on site, enough space though to have a training session after lounging all day😊 Vibe is absolutely fantastic, great music, friendly staff. 5* experience full on. 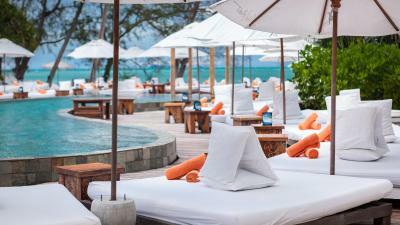 Nikki Beach Resort & Spa This rating is a reflection of how the property compares to the industry standard when it comes to price, facilities and services available. It's based on a self-evaluation by the property. Use this rating to help choose your stay! One of our top picks in Lipa Noi.Steps from Lipa Noi’s beautiful sunset coast, the luxurious Nikki Beach Resort & Spa offers relaxing stays with an exclusive beachfront and modern bungalows. 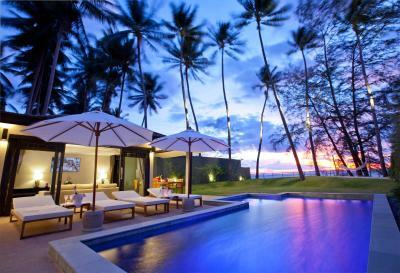 This chic boutique resort features a beachfront pool, fitness facilities and soothing massages. A short drive from various attractions, Nikki Beach Resort & Spa is 9.3 mi from Nathon Pier and 6.2 mi from beautiful Namuang Waterfall. 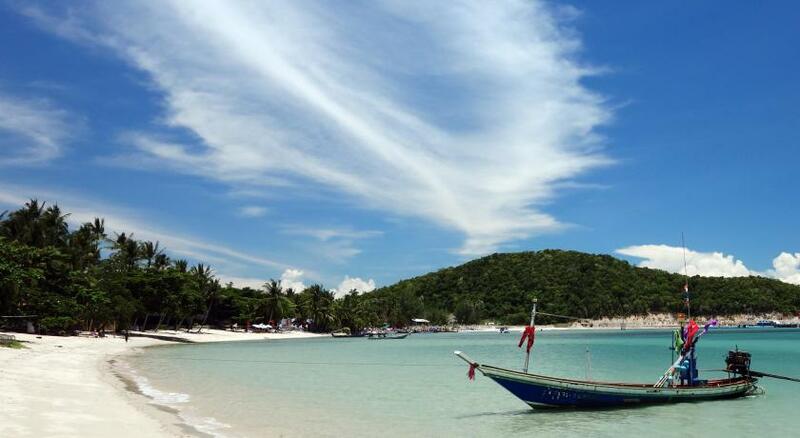 It offers free parking and is a 45-minute drive from Samui Airport. Featuring tasteful dark wood furnishings, bungalows open out to sweeping views of Thailand’s Gulf or tropical greenery. They have a 42-inch flat-screen TV, iPod dock and free Wi-Fi. 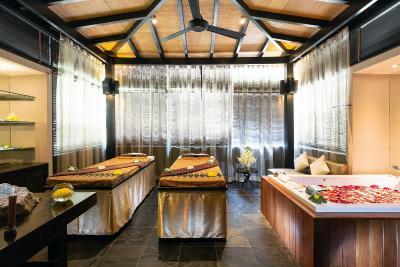 Lazy afternoons can be spent on day beds by the landscaped pool or with a soothing massage in the outdoor pavilion. Staff are on hand to help coordinate daily activities and tours. The spa center offers a copious variety of treatments ranging from body massages, scrubs, facials and steam room sessions. Tropical garden views accompany seafood, Thai and international specialties at Nikki’s restaurant. After-meal drinks and signature cocktails can be enjoyed at the bar, which features a DJ and Nikki Beach’s signature brand of music and entertainment. When would you like to stay at Nikki Beach Resort & Spa? Located on the private beach side of the resort, this air-conditioned room offers ultimate privacy and chic luxury. All are equipped with a walk-in rain shower, fully-stock premium mini-bar and a dining table. It features floor to ceiling glass walls and a spacious private lounging patio with a fan. Located on the private beach side of the resort, this air-conditioned room offers ultimate privacy and chic luxury with unobstructed views of the gulf. All are equipped with a walk-in rain shower, fully-stock premium mini-bar and a dining table. It features floor to ceiling glass walls and a spacious private lounging patio. It is steps away from the Nikki Beach Club. 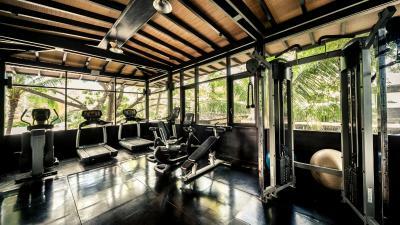 Located on the ground floor, this air-conditioned room features a walk-in rain shower and a patio with direct access to the 75 sqm pool. Located on the second floor, this sprawling suite offers views of the gulf and the pool. It include a spacious living room, 2 private balconies and a wooden bathtub. 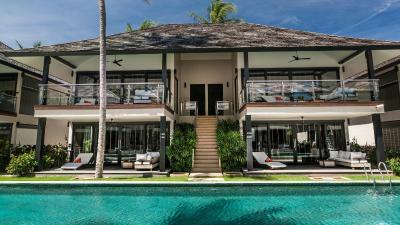 Located directly on the beachfront, this 2-bedroom villa features a private pool, a separate living area with a dining table and a private lawn. There is also an open-air and air-conditioned pavilion, as well as an outdoor shower. Butler service is available upon request. This sprawling unit connects 3 bedrooms and 2 bathrooms. There are 2 outdoor showers and walk-in rain showers, 3 flat-screen TVs and 2 mini-bars. 2 private patios provide access to the 75-yard pool. This unit features 2 connecting bedroom and 1 bathroom. They come with a mini-bar, a flat-screen TV, an outdoor shower and a walk-in rain shower. The private patio provide access to the 75 sqm pool. Located on an upper floor, this family suite features 2 private balconies with sea and pool views. It comes with 2 private bathrooms and aromatherapy products. This cluster unit features 4 bedrooms, 4 bathrooms and a private connected lounge on the ground floor. Spread across two floors, it offers direct pool access and private balconies or terraces. Guests can enjoy views of Ang Tong Marine Park and the sunsets. Each bedroom comes with a walk-in shower and aromatherapy products. This cluster unit features 5 bedrooms and 4 bathrooms. Spread across two floors, it offers direct pool access and private balconies or terraces. Guests can enjoy views of Ang Tong Marine Park and the sunsets. Each bedroom comes with a walk-in shower and aromatherapy products. Overlooking the swimming pool from an upper floor, this room features a private balcony with views of sunsets and Ang Tong Marine Park. The private bathroom comes with aromatherapy products. House Rules Nikki Beach Resort & Spa takes special requests – add in the next step! Nikki Beach Resort &amp; Spa accepts these cards and reserves the right to temporarily hold an amount prior to arrival. Nikki Beach Resort & Spa accepts these cards and reserves the right to temporarily hold an amount prior to arrival. Please note that guests are required to provide the original passport at the time of check in. Also, in case of credit card payment, the cardholder and the name on the card must be same. Please inform Nikki Beach Resort & Spa of your expected arrival time in advance. You can use the Special Requests box when booking, or contact the property directly using the contact details in your confirmation. Food and drink a bit overpriced. There could also be a wider selection of Thai food. Not much other restaurant choice nearby. The location is a 45 min drive from the airport. It’s nice and quiet if that’s what you’re looking for but isn’t the most ideal if you’re pressed for time and wanting to explore the best of koh samui. The selection of food on the Sunday brunch left much to be desired, I expected more and food of a higher quality. The breakfast buffet can also do with a bit more range. The resort itself looked it’s in some area felt some areas. There were also lots of families with young children which didn’t seem fitting for the type of resort. There wasn’t to many options in the resort restaurant. The fact that out of 8 days the music from the beach bear was so loud that it was disturbing our relaxing in the beach villa even if the doors were closed. I do not see this as appropriate considering the advertised "high star" level of the resort. Level of hospitality, Cleanliness, View, Sandy Beach, Free water activities are provided for guests. Everything was perfect! The hotel feels very calm and living in the garden villas was like living in a jungle. Very spacious, the cleaning staff did a great job everyday. Just amazing! Thank you. Not very close to other facilities or restaurants. Thank you to all the stuff for making our stay very enjoyable. Special thanks to Tiger, Nook and April for going that extra mile during our stay. Great place to stay with great facilities highly recommend. Also met some great people during our stay. The only downfall is the food/drink prices. A stunning resort which was clearly booked out every night with every villa occupied but over our stay there I think we never saw even 1 couple in the restaurant or bar at night. Such a lovely setting which could have such a lovely atmosphere if the restaurant and bar were busy at night. I can only assume this is due to the prices. However the food that we had was amazing so it’s definitely not a problem with the food. Beautiful resort. Staff are so welcoming and friendly. We stayed in the garden villa with the sea view which was so beautiful. The main pool area is amazing with the best sunset we’ve ever seen. Didn’t use the second pool but it also looked really nice and clean. Use of the free bikes was really useful in the day to go sightseeing or to the shop etc. We used the gym also everyday which was nice to have. Would definitely recommend. I think my expectations were that it’s fun place with loud music and party atmosphere near the pool. But it was the most peaceful and relaxing place :) Good breakfast, but mostly the same. Room was really nice, property very clean and very delicious cocktails and food by the pool. Beautiful sunsets. Beach was full of jellyfish. Hotel away from main beach, major events, dislocated. Great facilities, gorgeous room, bathroom, pool just meters away, good breakfast. Beautiful hotel in the wrong location. The hotel is absolutely gorgeous however you are in the middle of nowhere with very few amenities nearby as a result you are restricted to eating and drinking on the property which is exceptionally overpriced. They take advantage of the fact that you cannot go outside and prices are really high compared to the rest of the island.